St. John Chrysostom Antiochian Orthodox Church is a parish of the Antiochian Orthodox Christian Archdiocese of North America and the Greek Orthodox Patriarchate of Antioch and All the East. 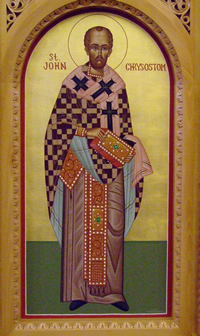 St. John Chrysostom Antiochian Orthodox Church was established in York in 1992 under the spiritual guidance of Patriarch Ignatios IV of Antioch in Syria, and his North American representative, Metropolitan Phillip. The Church of Antioch is one of the oldest Christian communities. As the Book of Acts tells us, it was in Antioch that "Christians" were first called by that name (Acts 11:26), and it was also from the Church of Antioch that Saints Paul and Barnabas were sent out on their missionary journeys. Immigrants from Syria and Lebanon began to organize churches in the United States in 1895, and through them the two thousand year spiritual heritage of the Antiochian Patriarchate began to enrich the New World. It is to this same Church, tracing its unbroken historical roots back to Apostolic times, that St. John Chrysostom Antiochian Orthodox Church belongs. Only about an eighth of St. John Chrysostom's parishioners trace their heritage back to Middle Eastern roots, however. St. John Chrysostom is a Pan-Orthodox parish, welcoming Christians of many different backgrounds, and celebrating all of its worship services in English. Our parishioners come from a host of Middle Eastern, Greek, Slavic, and Western European backgrounds. St. John Chrysostom Antiochian Orthodox Church has now grown to more than one hundred families, serving the south central Pennsylvania communities of York, Lancaster, and Harrisburg. In April of 1995 we were able, by God's grace, to purchase 14 acres of property at the corner of N. Sherman Street and Druck Valley Road. On April 28, 1997, we began construction of our first church building upon this tract of land. This building, which is now our church hall, was completed in October of 1997. Our permanent Church and Sunday School Wing were constructed in 2004. We invite you to visit us, and learn more about us. If you have any questions, or if I can be of service in any way, please do not hesitate to contact us. _The Orthodox Church embodies and expresses the rich spiritual treasures of Eastern Christianity. It should not be forgotten that the Gospel of Christ was first preached, and the first Christian communities established, in the lands surrounding the Mediterranean Sea. It was in these eastern regions of the old Roman Empire that the Christian faith matured in its struggle against paganism and heresy. There, the great Fathers lived and taught. It was in the cities of the East that the fundamentals of our faith were proclaimed at the Seven Ecumenical Councils. Christians of the Eastern Churches call themselves Orthodox. This description comes to us from the fifth century and has two meanings which are closely related. The first definition means true teaching. The Orthodox Church believes that she has maintained and handed down the Christian faith, free from error and distortion from the days of the Apostles. The second definition, which is actually the more preferred, means true praise. To bless, praise, and glorify God the Father, Son, and Holy Spirit is the fundamental purpose of the Church. All her activities, even her doctrinal formulations, are directed towards this goal. 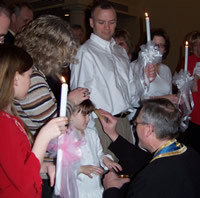 Occasionally the word Catholic is also used to describe the Orthodox Church. From the Orthodox perspective, Catholic means that the Church is universal, that she includes persons of all races and cultures. It also affirms that the Church has preserved the fullness of the Christian faith down through the centuries. _Our father among the saints John Chrysostom (347-407), Archbishop of Constantinople, was a notable Christian bishop and preacher from the fourth and fifth centuries in Syria and Constantinople. He is famous for eloquence in public speaking and his denunciation of abuse of authority in the Church and in the Roman Empire of the time. He had notable ascetic sensibilities. After his death he was named Chrysostom, which comes from a Greek word meaning "golden-mouthed."